TopoGEN now offers a catalytically inactive form of mutant human topoisomerase I purified to homogeneity (single band on SDS-PAGE). The mutation is a single residue change at the active site tyrosine (which has been changed to phenylalanine). This preparation is overexpressed in baculovirus and affinity purified as a single band on SDS-PAGE of 100 kDa. The enzyme cannot relax DNA (but still binds to DNA) and contains a short (6 residue) histidine tag. A test for nuclease contamination was carried out by assaying for the formation of linear KDNA and linear plasmid DNA. Incubations of 1 μg of catenated kDNA or supercoiled pUC19 DNA (4 hrs. at 37° C in the presence of 10 mM MgCl2) were performed. Linear DNA or breakdown products were not generated under these conditions. The final fraction of mutant topo I is a column pool and is in the following buffer: 20mM NaH2PO4 (pH7.4), 300mM NaCl, 500mM Imidazole. The final fraction was analyzed by SDS-PAGE and shown to contain a single, predominant band of 100 kDa (see below). Relaxation assays were carried out in a final volume of 25 μl in topo I reaction buffer (10X reaction buffer, supplied with this product is: 100 mM Tris-Cl, pH 7.9, 1.5 M NaCl, 1% BSA, 1 mM Spermidine, 50% glycerol). 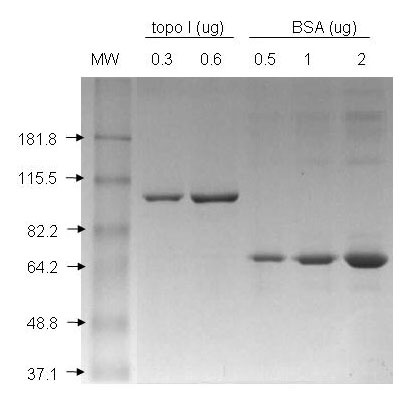 Supercoiled plasmid DNA was included at 0.25 μg/reaction. Reactions terminated with 5 μl (per 20 μl reaction volume) of stop buffer (5% sarkosyl, 0.0025% bromophenol blue, 25% glycerol). Reaction products were analyzed on a 1% native agarose gel. Under these conditions, relaxation activity was not detectable with up to 0.5 ug of mutant protein. The enzyme is shipped on blue ice or dry ice internationally. Store the enzyme at -20°C.